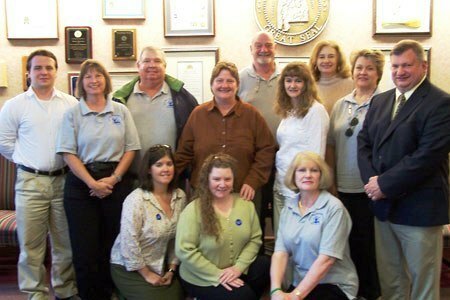 Homer Singleton attended his first AWW workshop in Elberta, Alabama in the Wolf Bay Watershed in 2003. In October 2007, with four years of monitoring under his belt, Homer got certified as both a water chemistry and bacteriological monitoring trainer. Since that time he has conducted or helped conduct 74 workshops, 22 recertification sessions, and has issued more than 371 certifications to over 186 volunteer monitors – WOW- what an impact!. 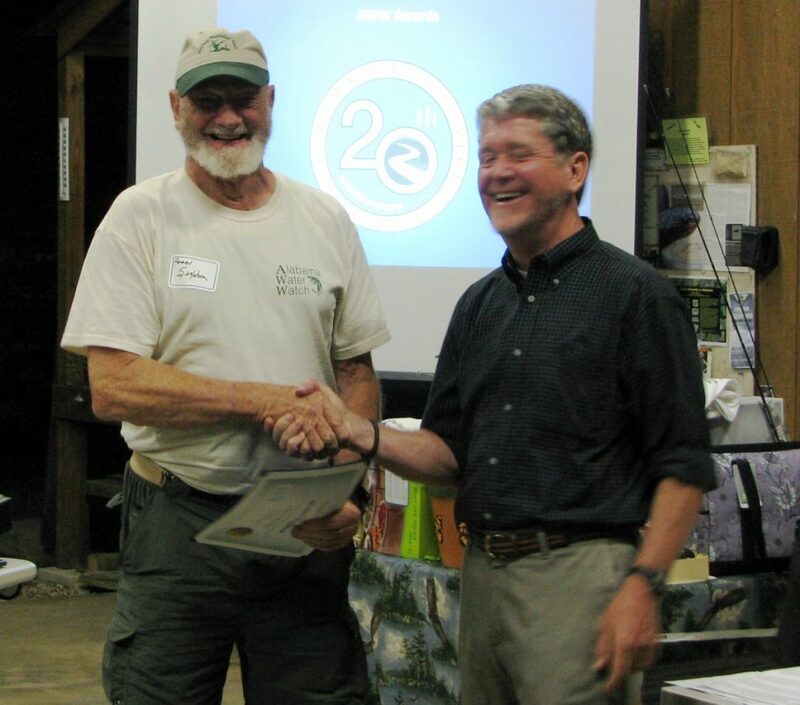 In recognition of his outstanding service as an AWW trainer, Alabama Water Watch was honored to present Homer with the 2013 Trainer of the Year Award. Click here for award article. Homer receiving the AWW Trainer Of The Year Award from Dr. Deutsch in 2013. 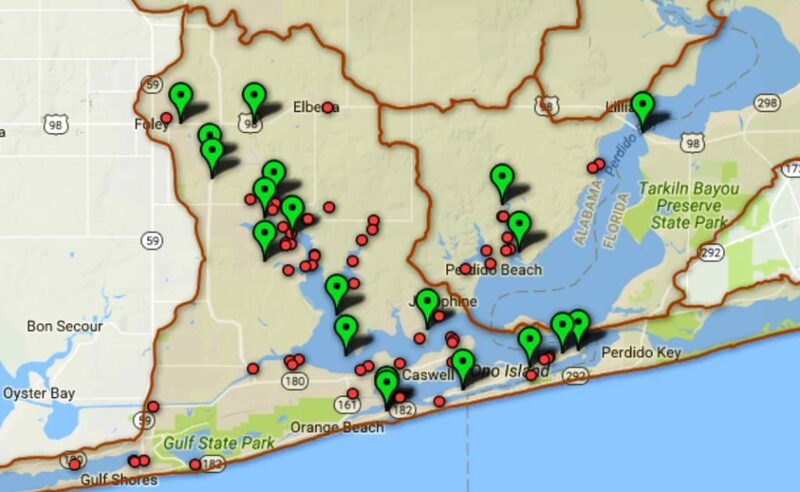 In addition, Homer has submitted 224 water chemistry records and 210 bacteria records, for a total of 434 data records (see WBWW sites map below; click here to access WBWW water data) submitted to the AWW water quality database – DOUBLE-WOW!! And in his spare time, he serves on the Wolf Bay Watershed Watch board of directors (see http://www.wolfbaywatershedwatch.org/home/). Map of WBWW monitoring sites, from AWW online database. I live in my old family home, now on the bank of Sandy Creek, a mile or two above Wolf Bay and 7-8 miles north of the Gulf of Mexico, as the Blue Heron flies. 2. What stream, river, lake, bay, or bayou is your favorite water-spot? 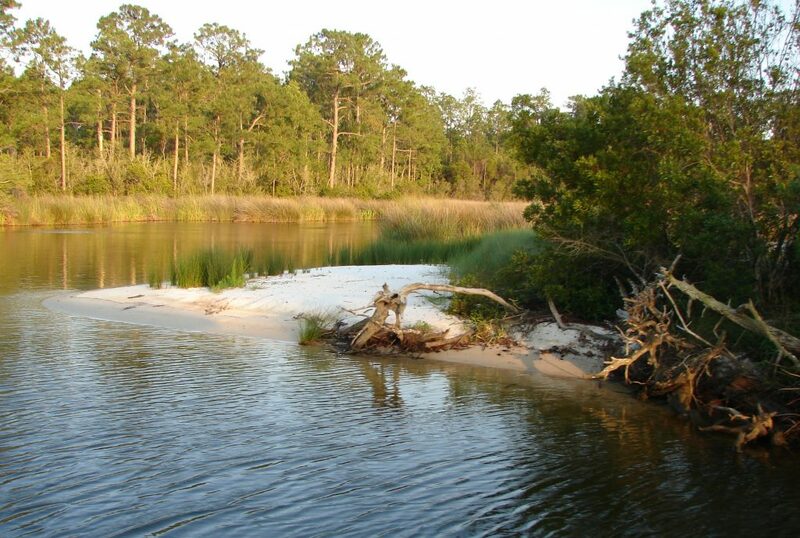 Sandy Creek and the other creeks flowing into Wolf Bay are my favorite “water spot(s).” I grew up spending lots of time on the Bon Secour River so waterside is naturally “home” for me. Coastal habitat of Wolf Bay. 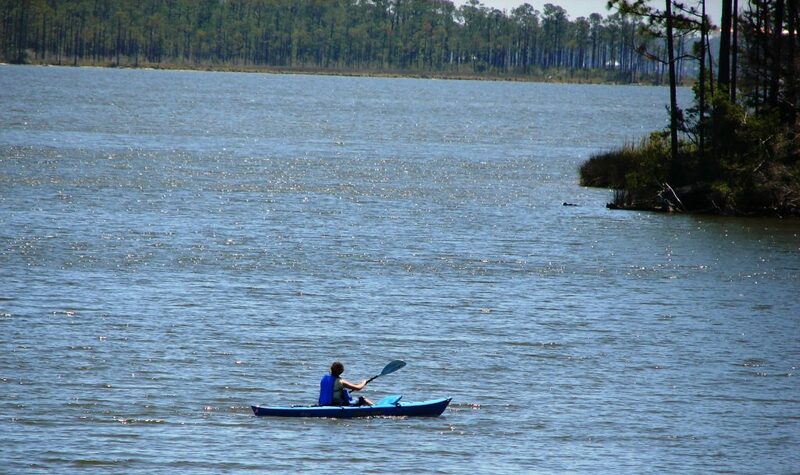 Canoeing, kayaking, and boating are my favorite activities, conducted at a pace that allows getting acquainted with the vegetation, birds and aquatic creatures alongside. Enjoying the beauty and serenity of the bay via kayak. Everybody has an opinion about whether things, including water quality, are better or worse. 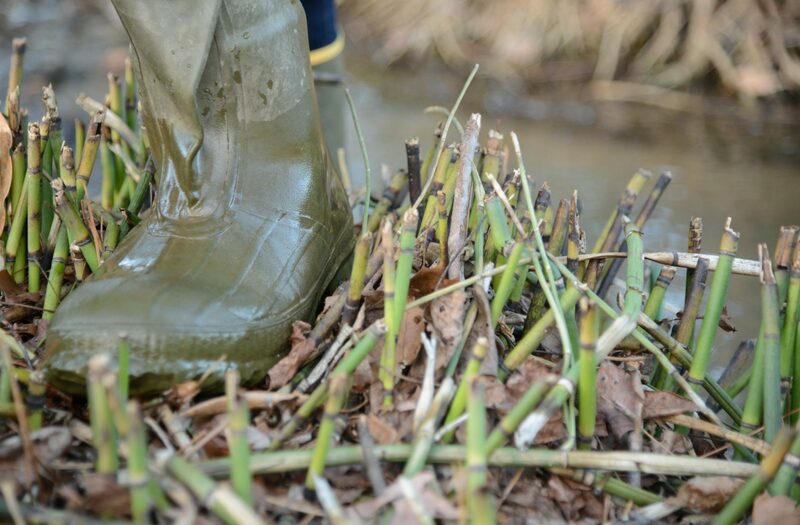 The state does some monitoring but at very few sites and very few times during the year. A neighbor “recruited” me to monitor around 2003 and I really liked the opportunity to develop some more comprehensive, quality water data. The effort to get Wolf Bay classified as “Outstanding Alabama Water” was underway and afforded a way to actually impact development’s effect on our waters. I was recruited to assist our trainer and became our Wolf Bay Watershed Watch lead trainer when she took a job with the Florida Blackwater State Forest and was no longer available. Homer enjoying the moment in a photo celebrating OAW status for Wolf Bay, with then-president of WBWW, Stan Mahoney (back row next to Homer), WBWW officers, ARA officers and Lynn Sysk, ADEM (on far-right). We have a “micro” watershed, 12 miles long by 10 miles wide, more or less. We are impacted by flow from other watersheds only at the extreme southern end of Wolf Bay. Development pressure continues to be the largest challenge. Waste and trash making their way into streams continues to increase. An increase in impervious surfaces has produced ever sharper peak flows in streams. Interest in monitoring has decreased as AWW protocols address these issues in a limited way. Water quality problems originate upland, not in the water or at the banks. Getting people to recognize that the solution to water issues begins with their own houses, parking areas, yards, roads and towns is the number one problem. I guess that’s the biggest lesson learned and challenge to be faced. 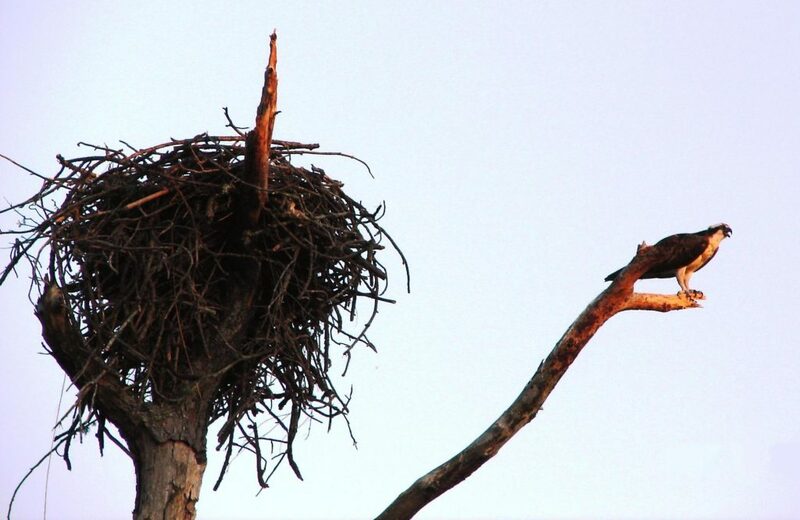 Resident osprey vigilantly watching over the bay.